Banixx® has been used successfully for wound care, skin and hoof infections on horses, dogs and puppies, cats and kittens, parrots, falcons, llamas, ferrets, alpacas, show cows, sheep, pigs, reptiles and even a one-month old foal. 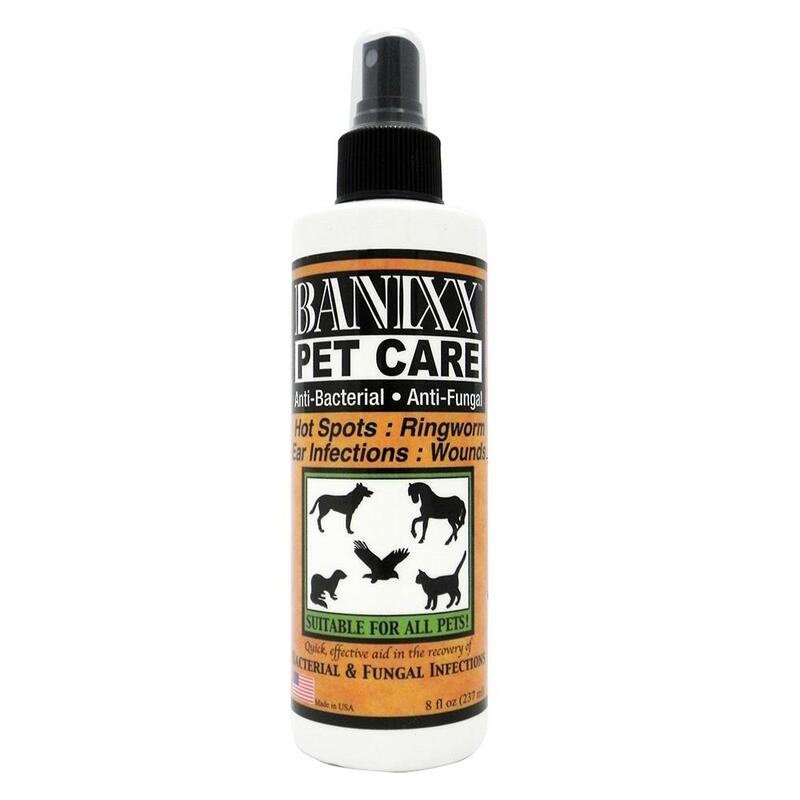 Banixx is both effective and extremely safe - it can be used without worry on wounds or fungus infections around the eyes, nose, mouth, and ears, and has proven to be particularly effective at eliminating dog ear infections, dog hot spots and dog or cat ringworm. Use it with confidence to successfully treat wounds, fungus, rain rot, ringworm, scratches, abscesses, thrush, white line disease, bacterial infections, fungal infections, fly bites, or just some itchy skin on your animals. Banixx® is a wound, skin and hoof care product that is odor-free, non-staining, and sting-free. It is non-toxic, steroid-free, antibiotic-free, and does not contain alcohol or tea tree oils, yet works wonders in any situation where bacteria or fungus are involved. In addition to being safe for use on any animal, Banixx® is environmentally friendly and proudly made in the USA. While Banixx® is a powerful anti-fungal and antibacterial agent, it is also extremely tissue-friendly and clinically proven harmless around the eye. And because it contains no alcohol or iodine it will not cauterize tissue. Banixx® is ideal for use with young or skittish horses, or any animal that can be difficult to treat. In fact, Banixx® Wound & Hoof Care is such an effective one-step treatment for all manner of equine ailments that it came out on top in The Horse Journal's independent trial of skin/hoof combination products.